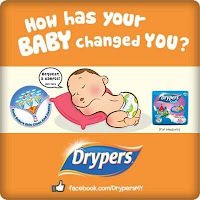 Drypers recognizes the changes parents make for their babies. These life-changing experiences are reflected in a series of videos showing various mothers sharing what they have done for their little one and why they think the changes are worth making. What is your story? Submit it to us and stand a chance to win prizes worth up to RM12,000! Visit Drypers Changes Worth Making contest page for more details.